People who ate the most chocolate had a 27 percent and 48 percent reduced risk of heart attack and stroke. 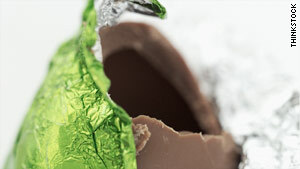 (Health.com) -- Eating as little as a quarter of an ounce of chocolate each day -- an amount equal to about one small Easter egg -- may lower your risk of experiencing a heart attack or stroke, a new study has found. For best results, the chocolate should be dark, experts say. "Dark chocolate exhibits the greatest effects, milk chocolate fewer, and white chocolate no effects," says the lead author of the study, Brian Buijsse, a nutritional epidemiologist at the German Institute of Human Nutrition, in Nuthetal, Germany. Compared with people who rarely ate chocolate (about one bar per month), the people who ate the most chocolate (slightly more than one bar per week) had a 27 percent and 48 percent reduced risk of heart attack and stroke, respectively, the researchers found. The heart benefits observed in the study may be due in part to lower blood pressure, the study notes. Previous studies have suggested that eating chocolate can lower blood pressure, and the researchers observed a similar -- though less pronounced -- association in this study. "The good news is that chocolate is not as bad as we used to think, and may even lower the risk of heart disease and stroke," says Buijsse. "The bad news, at least for some of us, is that the amounts that are needed to benefit from these effects appear to be quite low." "This is only one small egg per day," says Buijsse. "Eating higher amounts will most likely result in weight gain. If people start eating small amounts of chocolate, it should replace something else, preferably other high-calorie sweets or snacks." The people in the study were part of a larger study on the effect of diet and lifestyle on cancer risk. For the current study, Buijsse and his colleagues excluded anyone with a history of heart disease or stroke, and also controlled for age, diet, lifestyle, and other factors. Still, they note that factors not recorded in the surveys -- rather than chocolate consumption alone -- could have been responsible for some or all of the health benefits they observed. The study had some other important limitations. Most notably, the researchers did not determine whether the study participants ate dark, milk, or white chocolate. Using one of the surveys administered during the study, the researchers estimated that 57 percent of the participants ate milk chocolate, 24 percent ate dark chocolate, and 2 percent ate white chocolate. This data, however, came from a subset of just under 1,600 participants, so they are merely estimates that may not have been borne out in the full study population. Experts believe that natural compounds known as flavonoids (or flavonols), which appear to promote artery health and reduce inflammation, are responsible for the cardiovascular benefits that have been associated with chocolate consumption. Flavonols are found in cocoa, and dark chocolate contains more cocoa than milk chocolate does. "The benefits of chocolate come from flavonoids, and those are mainly found in dark chocolate, not Easter eggs, which are usually milk chocolate and have a lot of saturated fat," says Julia Zumpano, a registered clinical dietitian at the Cleveland Clinic, in Ohio. "I usually recommend less than one ounce of dark chocolate a day -- a tiny square -- for heart health," she adds. "The chocolate should be at least 70 percent cocoa with limited added sugar." Despite their findings, Buijsse and his colleagues caution that more research, namely randomized trials on the heart benefits of chocolate, is needed. Buijsse admits to being conservative about his own chocolate consumption. "If I eat chocolate, which is not on a daily basis, I limit my intake to a small piece," he says.